If the luxurious Condominium on Sukhumvit Road is one of your dream, we want you to meet with the Water Diamond Tower, the Luxurious Condominium in ones' mind. 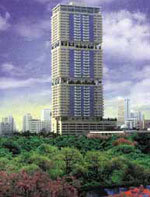 With the single modern forty six-storeyed building, we desinged every 10 floors as the Garden floor and Fire break. This is the intelligent technology in architecture that designed the beautiful garden and safety from fire by fit. The Waterford Diamond Tower is located on Soi Sukhumvit 30/1 in which is apart from Sukhumvit Road only 50 metres. We are surrounded with many important places. With the convenience in transportation, you may forget that on day in Waterford has more than 24 hours.